​Spinning tops are quick to make and a quick spin gets them going. There are downloadable pdfs with instructions for teachers and a cartoon version for students. The instructions are below too. We would like to make a video of some of the many variations of spinners. If the nail is sharpened it will make better holes. A flattened lid will spin better. see bottle tops in materials section. The hole must be in the middle, throw away bottle lids with off centre holes. Any size of stick is OK, but keep it short. The longer the stick the harder to balance. The size of the stick influences how fast it can spin, a thin stick turns more times in your finger so can be made to go faster. The point must be sharp but strong. A perfect top will look still even while spinning. 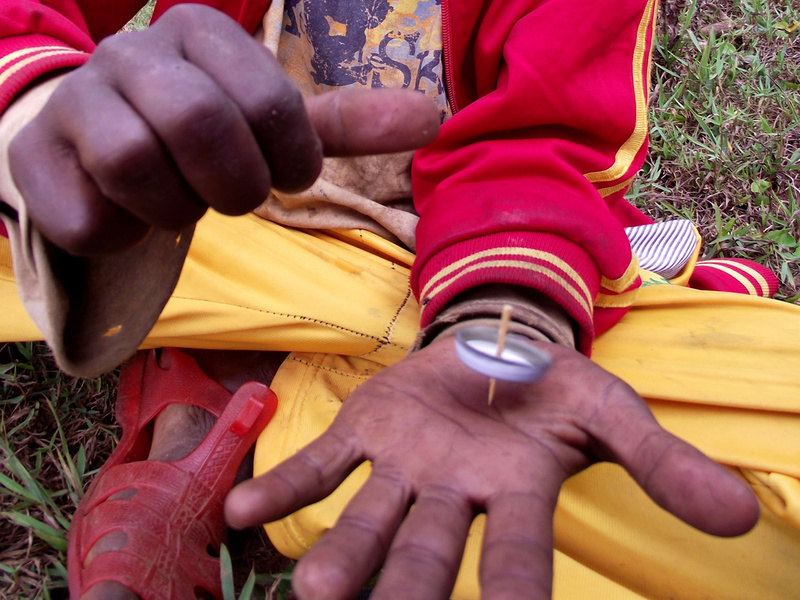 Spinning is by trapping the stick between you finger and thumb then flicking. The top will work best if the flick is in the air and the top lands without going to one side as the lid may hit the ground. Any imbalance will make the top move on the table, if the tip is not sharp it will move too. When flicked upside down the top lands easier as the lid is high this also makes the top dance around more but does not spin as long unless very well balanced. High speed spinning is done with larger tops by using the length of your hand and rolling the stick slowly, moving your hands in opposite directions, then accelerating to the end, the top must land straight up. High speed upside down spinning has the problem of thumbs but works well with practice. For a top to work well at high speed it has to be very well balanced. Tops can be made from any material, only the point and a balanced top is important, 2 split sticks will work. Tops can be made any size too but get harder to get started. Heavier tops will go for longer but have more friction at the point which will also wear quickly, heavier tops are harder to get spinning fast. CDs work well if you can fill the hole with mud, gum or clay to keep them central. Bottle tops help to hold it together, the extra radial energy of the larger circumference make them work very well. The top makes a good base for making colours join together, a disc of red and blue stripes will make a purple etc. The centrifugal forces in a good top allow it to be dropped and still spin or even thrown from one hand and caught in the other hand while it still spins. Spinning tops spun on their side with 2 hands do not need balance and can go a long way, the top will take a curved route if the stick is heavier on one side. Many shooting games can be made. A small movement forward with the spin helps the top change from rotational momentum to linear momentum easier, otherwise the top skids and bounces before it goes forward. Probability can be explored with making them into dice with a cardboard addition. Make sure the stick is glued firmly and doesn't change position and spoil the results. All the dice will show some bias unless perfectly made. Competions: largest, heaviest, smoothest, prettiest, best colour mixing, best made, longest spinning. The top relies on energy put in by the process of spinning. Spinning puts a lot of energy into the top particularly the faster moving outside (kinetic energy). Friction with air and at the point take this energy away and the top will stop. The energy stored in the spinning does not want to change direction (gyroscopic force) and will resist change until the stored energy reduces to the point where gravitational forces are stronger and it falls over. Spinning on its side is changing the rotational energy to linear momentum, at first the top resists then the friction on the edge pulls the top to linear motion. keep it from falling over. The point has low friction with the surface it is spinning on. Even a coin will spin well. At slow speeds the disc should be low on the stem, for high speed the gyroscopic forces are much stronger than gravity so it doesnt matter till it slows down.